Electric toothbrushes have been used for a long time. The earliest electric toothbrushes were initially developed for patients with limited motor skills and orthodontic (braces) patients. There are a few basic designs in electric toothbrushes. Most of them have a certain pattern of brush head movements. Others may have specific types of brush bristle moving cycles, unique frequency of movement, or discharge certain ions to facilitate cleaning. One brand even features an auto-stop function when excessive pressure is applied onto the teeth. Regular toothbrushes require reasonable manual dexterity to adequately clean our teeth on a regular basis. Therefore, incorrect brushing technique may reduce the effectiveness of optimal cleaning. Successful manipulation of the toothbrushes may also not be possible when the individual is too young, too old, having a disability, or wearing some form of dental appliance (such as braces or dentures). Incorrect brushing techniques not only lead to ineffective cleaning, it may even harm the teeth and gums by exerting excessive pressure. 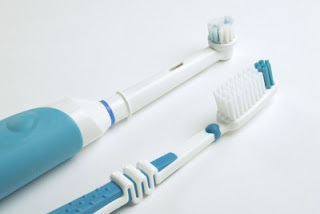 Some studies have shown that electric toothbrushes are more efficient at cleaning teeth than manual toothbrushes. In the case of the rotation-oscillation type brush heads, there is less room for incorrect brushing. As a result, the effectiveness of tooth-brushing is enhanced. This is one reason why some dentists also recommend electric toothbrushes for children. Electrical toothbrushes are also helpful when regular dental care is provided by a third party such as a nurse in a nursing home. When one is choosing an electric toothbrush, it is important that the size of the toothbrush is correctly chosen. Usually the brush head should be less than 2cm in length and 1cm in width. A toothbrush that is too big is simply not agile enough to reach all surfaces especially the back teeth. In general, soft bristles are kinder to the teeth and reduce the chance of traumatising the gums. Some types feature round end bristle filaments. These microscopic tooth bristle tips are also less abrasive to the gum and dental enamel. Pricier models may not necessarily the best for your budget or dental condition. Electric toothbrushes occasionally require technical maintenance or replacement of parts, such as the brush head. It is therefore important to purchase an electric toothbrush that has a local retailer who carries the parts. Check to see if the manufacturer has a local warranty program in case fixing or repairing is needed. Consult your dentist for some practical tips on your electric toothbrush selection process.